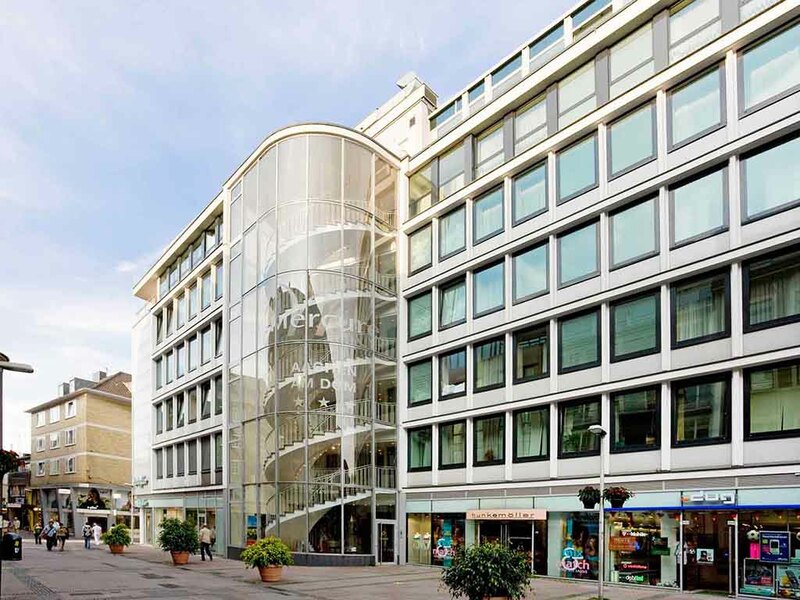 Our hotel is in the heart of the old Carolingian city of Aachen, home to world-famous sights such as the Imperial Cathedral and Carolus Thermen baths. Our 3-star Superior Mercure Aachen am Dom hotel has 117 rooms with free WIFI. Arrival: The hotel is just 766 yards from the main train station, 24.9 miles from Maastricht Aachen Airport and 49.7 miles from Cologne/Bonn Airport. If traveling by car, we are 1.9 miles from the A544 highway and you can park in a public car park near the hotel (charges apply). Aachen-based companies benefit from the ideal location between Europe's metropolitan areas: the Rhine-Main, Brussels/Antwerp, Rotterdam/Amsterdam and Ruhr regions. 3.5 million people live in the Euregio Maas-Rhine region alone - all potential customers. At the 3-star Mercure Hotel Aachen am Dom, you can choose between Standard Rooms with a single or double bed, Superior Rooms with a double bed and Privilege Rooms with a double bed and sofa. We have reduced mobility rooms for guests with reduced mobility All 117 rooms are non-smoking, air conditioned and have WIFI. One child aged up to 12 years can stay in your Privilege Room free of charge, and your pet is also welcome (charge of EUR 15/night). In our hotel bar, "Klenkes Quelle," you can choose from the extensive drinks menu every day between 8pm and midnight. Relax and unwind in the friendly atmosphere. 편리한 위치에 안정된 서비스로 편안한 스테이였습니다. 단지 욕실 수압이 조금만 더 높았으면 하는 아쉬움은 있네요. 욕조에 물을 받을때 시간이 아주 오래 걸렸거든요. 비지니스호텔로서 깨끗하고 시내로의 접근이 용이하고, 직원들의 친절함이 좋았습니다.